The best-performing, most versatile value foam system in its class. Pierce foam systems help you perform way beyond the capabilities of water alone. That’s why we’ve developed and delivered more of them than anybody else. The Pierce Husky™ foam system delivers serious knockdown capacity without drawing the serious amps that needlessly strain your rig’s electrical systems. 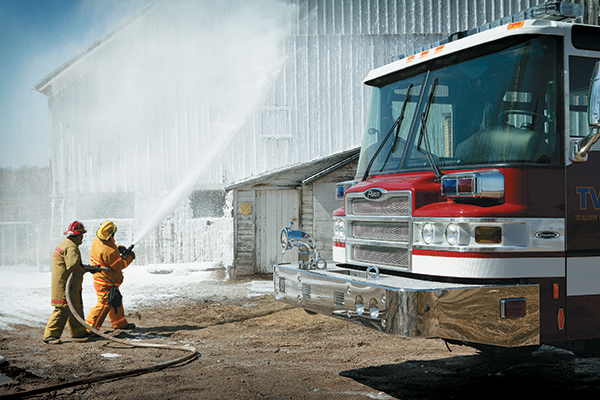 The Husky system handles foam viscosities for Class A and B fires, from Alcohol Resistant AFFF to Class A foams. Plus, all Husky foam systems allow for auxiliary foam pickup, so you can run multiple types of foam at a moment’s notice. It’s easy to operate and automatically adjust foam output to the proper percentage. Join in on Encinitas Fire Department's foam systems training. Foam systems training is available at your own site or at the Pierce training center in Appleton, WI. Thoroughly instruct your department on maintenance and operation in a variety of applications.